A historical fiction book based on actual people, places, and events in Kansas’ history. The book tells the story of Wabaunsee County and its ties to bleeding Kansas and the Underground Railroad, featuring the Mitchell family in particular. It covers the time from 1856 to 1932. Dawn of Day includes discussion questions and activities related to the book and for further study. Henrietta never liked history. But on a late summer day in 1932, she and her sometimes annoying little sister Irma Jean, hear an exciting true story from their artist friend, Maude Mitchell—a story that takes them back in time 75 years. In 1856, Maude’s father, William Mitchell, came from Connecticut to support the Free State cause in Kansas. William and his sister Agnes hid runaway slaves in their cabin, including Jesse and Abby, two slave children who’d been cruelly separated from their mother. Featured in the Books Section of the August 2012 edition of Kansas Country Living Magazine. Here is the link to read the entire book review: Kansas Country Living, August 2012. J.A. McPhail, (aka Jeanne Ann, aka Jeannie,) a native of the Sunflower State, possesses a rich fifth generation Kansas heritage. 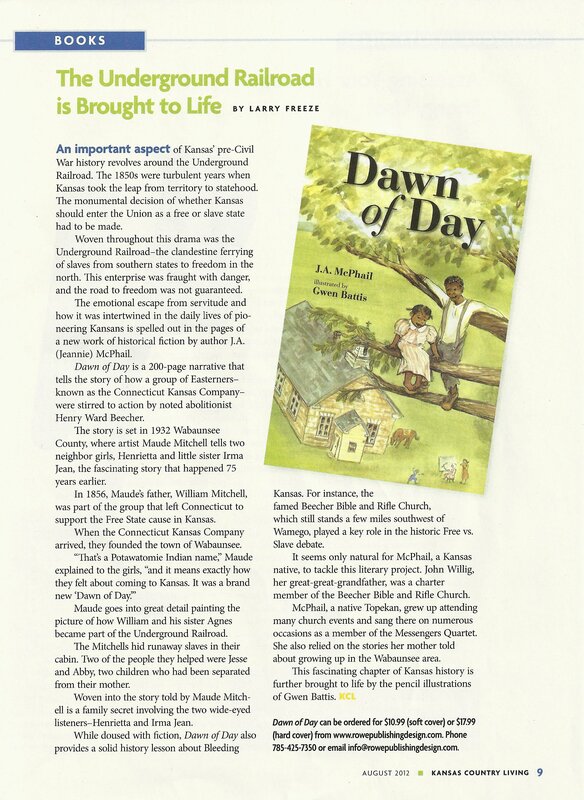 Her great-great-grandfather, John Willig, was a charter member of the Wabaunsee Beecher Bible Rifle Church, featured in Dawn of Day.Born and raised in Topeka, Kansas, the author grew up attending many BBRC Old Settlers Homecomings. As children, she and her brother sang a duet at one of the annual gatherings. Years later, after marrying her high school sweetheart and raising a daughter, the McPhails returned to the church several times, singing with the Messengers Quartet. During the seven years as her full-time care giver, McPhail listened to her mother, Irma Jean, tell stories about her childhood growing up in the Wabaunsee area. 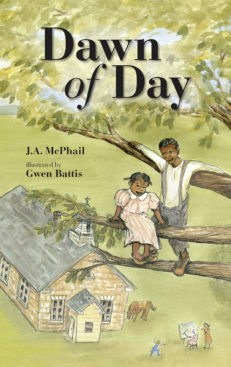 History and family memories, combined with inheriting two Maude Mitchell paintings of her grandparents’ homesteads, inspired the unique blend of fact and fiction used to create Dawn of Day. As a former editor, columnist, and library director, McPhail has written hundreds of articles and columns for various newsletters, magazines, and newspapers. 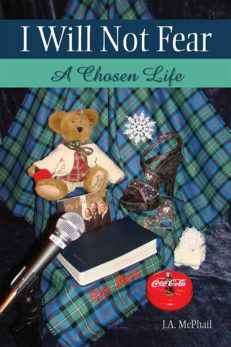 She currently writes devotions and maintains a reading/writing page on her family’s website, www.jamcphail.com, as well as being a guest writer for her local newspaper. J.A. McPhail now lives and writes in beautiful western North Carolina. She and her husband, Dennis are also a Southern Gospel songwriting team. But Kansas will always hold a special place in her heart. 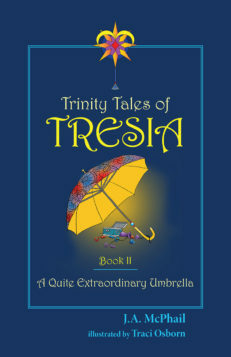 I have loved this book and wanting to purchase my second copy. I attended the Beecher Bible Church in the 50’s and 60’s and return to their annual homecoming. For me, It has been great to read this book and Jeanne MacPhail has written facts and information as I remembered it, well done. I’m purchasing this book to share with a Library series on Bleeding Kansas. Looking for a book that reflects love? I loved every page! McPhail is a gifted writer. This book is based on true incidents. The incidents are true history from accounts written by my own great and great-great grandfathers. I wish she had included more historical detail so that young people would be more sure to understand the context. Editorial Review – While doused with fiction, Dawn of Day also provides a solid history lesson about Bleeding Kansas. For instance, the famed Beecher Bible and Rifle Church which still stands a few miles southwest of Wamego [Kansas], played a key role in the historic Free vs. Slave debate. It seems only natural for McPhail, a Kansas native, to tackle this literary project. John Willig, her great-great-grandfather, was a charter member of the Beecher Bible and Rifle Church. This fascinating chapter of Kansas history is further brought to life by the pencil illustrations of Gwen Battis. 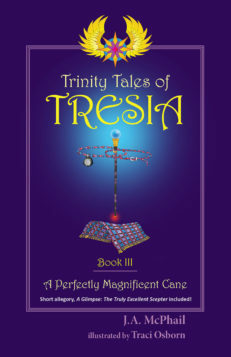 A great read – This was a wonderful book. I learned a lot about the Underground railroad. I encourage any one to take the time, lay back and enjoy this GREAT read. Nicely done, inspiring too! What a delightful and inspiring story. An excellent read for any book loving child or adult. The story is historical and brings you right into the events taking place. Educating on the history of our nation and the goodness of our citizens who proved willing and able to meet the need of those escaping slavery. You could almost taste those cookies. Choices Create History – Threads of innocence, humor, prejudice, compassion and strife are woven into a vibrant tapestry of historical fiction designed to enlighten the reader about the Kansas underground railroad of human cargo before the Civil War. 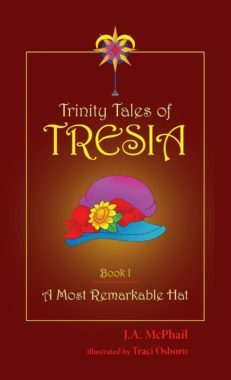 A compelling story is well told by the great-great granddaughter of a charter member of the Wabaunsee Beech Bible Rifle Church. 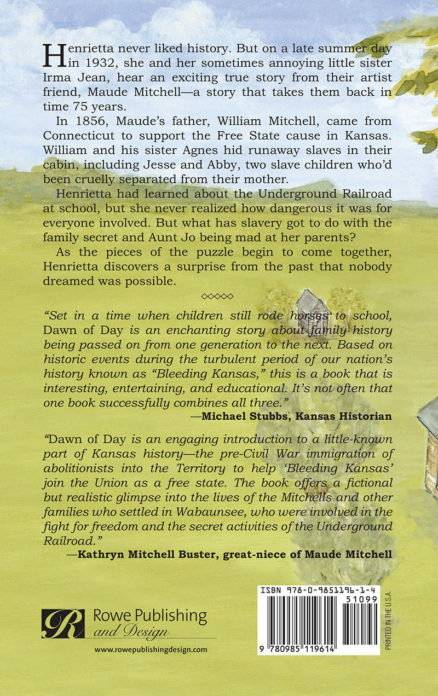 I Can’t Get Abby Out of my Mind – Dawn of Day taught me much that I never knew about the history of Kansas and its “slave” history. But it is the slave child Abby, wrenched from her mother and sent North with her slightly older brother, who gave me an unforgettable insight into the heartbreak and fear of those who traveled on the Underground Railroad. 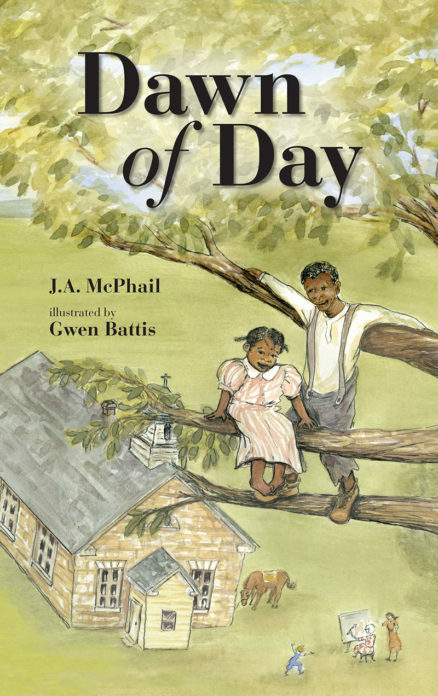 Her story made me realize that it wasn’t just adults who traveled the terrifying Underground Railroad. When we meet Abby many years later, the “old” Abby is as memorable and wonderful as we want her to be. 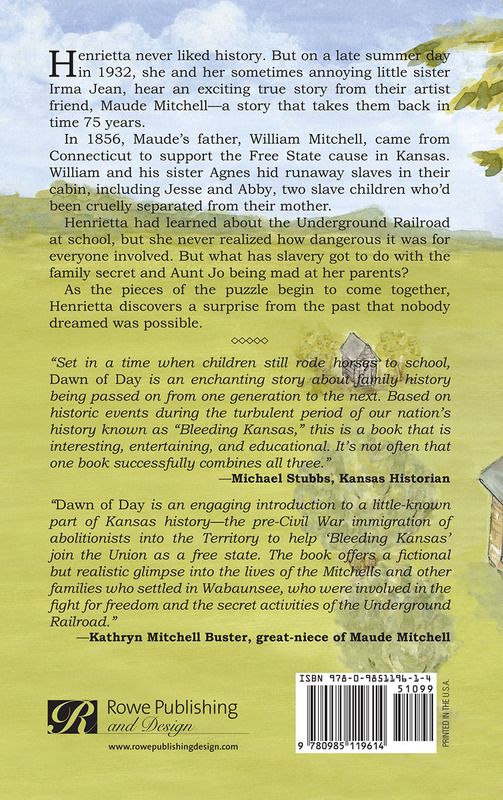 Editorial Review – Dawn of Day is an engaging introduction to a little-known part of Kansas history—the pre-Civil War immigration of abolitionists into the Territory to help “Bleeding Kansas” join the Union as a free state. The book offers a fictional but realistic glimpse into the lives of the Mitchells and other families who settled in Wabaunsee, who were involved in the fight for freedom and the secret activities of the Underground Railroad. Editorial Review — Set in a time when children still rode horses to school, Dawn of Day is an enchanting story about family history being passed on from one generation to the next. Based on historic events during the turbulent period of our nation’s history known as “Bleeding Kansas,” this is a book that is interesting, entertaining, and educational. It’s not often that one book successfully combines all three.